I love the Incryptid series, the crazy Price family and the huge variety of weird and wonderful creatures (particularly the Aeslin mice!) are just so much fun to read about so of course I was excited to read Tricks for Free even though Antimony is actually my least favourite of the siblings. I enjoyed her first book a lot more than I expected to but unfortunately this one just wasn't as good as I was hoping it would be. Antimony is the youngest of the Price children and she shows a lot of immaturity here, she tends to blame her family a lot and act like she was never loved as much as Verity and Alex but at the same time she complains that they're overprotective of her because she's the youngest. Which one is it Antimony? Either they don't care or they care too much - they can't be both at the same time! I can understand why she has to keep her distance from her family here but I missed them all in this story, Mary pops up a few times but it's just not the same as having all the characters I love around and since she's also separated from the Aeslin mice we don't even have them to lighten the tone a bit. We do get to see a few of Antimony's old friends from her roller derby days but to be honest I've always found Antimony's endless talk of skating pretty boring in the short stories about her so that didn't really help me much. Seanan McGuire has obviously spent a lot of time and energy creating her own theme park called Lowryland, it's a full scale thing with it's own imaginary characters and lots of fun rides and Antimony is currently hiding out there as one of their newest employees. I appreciate the effort that the author has gone into making somewhere that feels so real but the endless descriptions of the place started to get boring after a while. It's a bit like having a friend come home from Disneyland and then wanting you to sit through a slideshow of the 600 photos they took, the first few are interesting enough but it's not long before your eyes start to glaze over, especially if you know you'll probably never be able to afford to go there yourself! Some things are only THAT interesting if you're actually there at the time and I felt the endless descriptions really slowed down this story. There wasn't really a huge amount happening in this book and for probably the first two thirds I was pretty bored which is unheard of for this series. 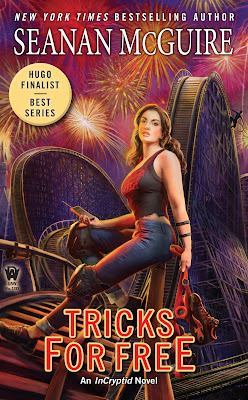 Things definitely got more interesting when Sam finally turned up, the last third of the book was far more exciting and it's definitely set things up for the next instalment but I just didn't love Tricks for Free as much as I'd hoped to. I still think Seanan McGuire is an incredible author, this series is usually so much fun to read and I'm also a huge fan of the October Daye books so she remains on my auto-buy list.